Browse through the different Pedestrian gates with side panels below for inspiration and contact us for a quotation. A single pedestrian Needham gate with large matching curved side panel to secure the driveway. Made from Padauk hardwood this timber is no longer available. The photo below shows the same gate and side panel after finishing with a hardwood oil. A single Glemham gate with curved frame and large matching straight top side panel. Made from Iroko hardwood. Iroko is partly inconsistent in colour and can been seen with a pinkish tinge or darker golden colour, however all timbers will naturally weather down evenly over a short period of time to a silver grey colour. 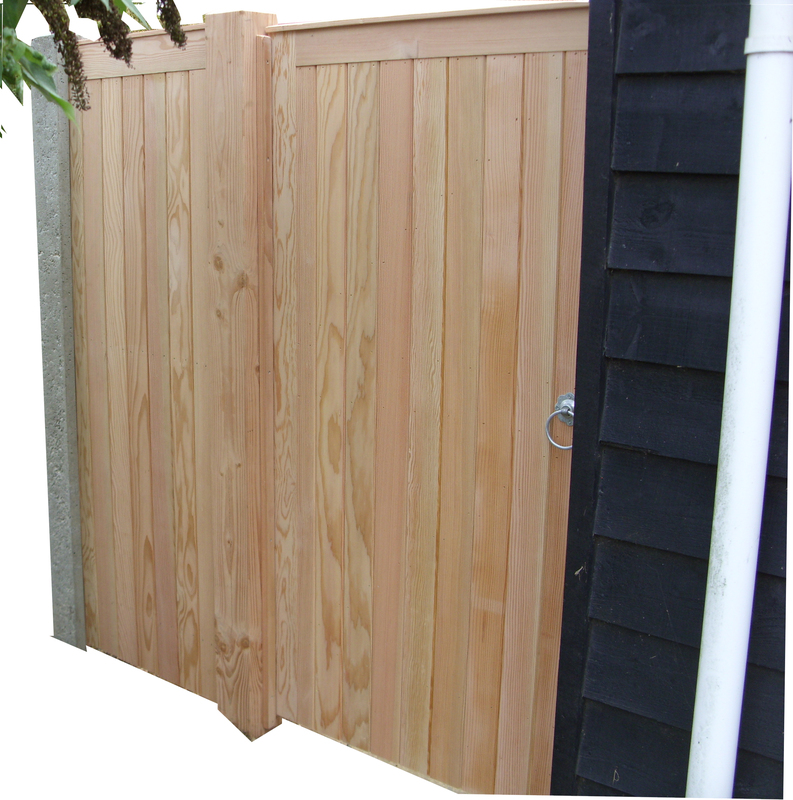 Here a single Glemham gate is teamed up with a side panel, all in Douglas Fir. A central Douglas fir post has been used to hang the gate with a slotted concrete post on the other side of the side panel. You can see the lack of knots and the beautiful grain that you get with this timber and although a softwood it is particular dense and especially hard and durable with a lack of movement. Unlike other softwoods it does not require treatment but if you are thinking of painting or staining your gate this is the best option to go for as you will achieve the best finish. co-ordinating side panels made a different heights to sit on the ground and on top of a small wall to give an even top line. The Glemham gate here is made from pressure treated Scandinavian redwood, it was a tight space which wouldnt take the opening of a larger gates so a small matching side panel was used to fill in between the gate and the Summer house. The photo below shows the reverse of the gate and panel. A Straight topped Glemham pedestrian gate with matching side panel on both sides all finished in Sadolins Classic Burma Teak. A Haughley pedestrian Closeboard gate with matching framed Closeboard side panel to the left and sloping Closeboard fencing to the right.